Getty, aka Serengeti Nitrus, born December 1991, is an 11-year-old brindle male found as a stray on the streets of Dallas. We have no idea what his life has been up to now. 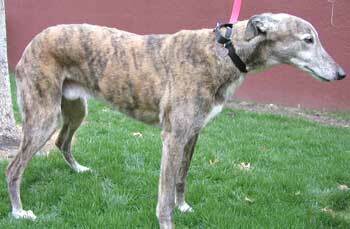 Although Getty's appearance is one of a healthy greyhound, he unfortunately is heartworm positive, which at his age can be a complication. In addition, he displays signs of arthritis in his rear legs, which causes him to walk very stiffly. He is currently undergoing treatment for the heartworms, and he will be in his foster home while he is recuperating. 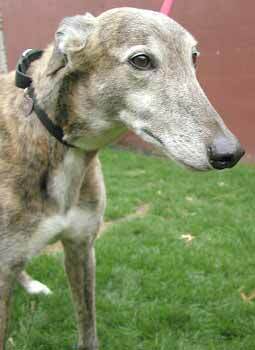 Heartworm treatment is expensive and very dangerous for the greyhound, and even more so for Getty who is older.